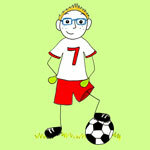 I have illustrated 5 books for Andy Cope. 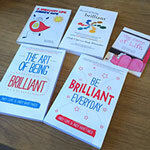 Two of the books, a republished "The Art of Being Brilliant" and "Be Brilliant Every Day", found their way into the WH Smith non-fiction charts. 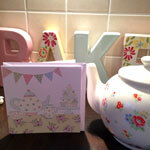 I illustrate and make a range of handmade items including greeting cards and gift tags. Requests for these items can be made on the Contact page. 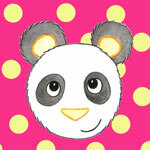 I have a range of apps on the App Store available for iPhone and iPod touch users. Some are wallpapers and others are in the form of a picture book to keep children entertained. Around Christmas 2010, Apple put one of my apps, "Christmas Wallpapers" as one of their featured apps, gaining worldwide attention and a sharp increase in downloads. Click here to see the apps on the App Store. One of my passions is creating images for children - whether it be for a greeting card, an activity at a pre-school or as part of a story. I am particularly interested in creating illustrations for children's picture books and love to work with children's writers to bring their stories to life.